Photo: © Global Oneness Project. The Gamo Highlands are perched high above the African Rift Valley in Southwestern Ethiopia. This isolated area is one of the most densely populated parts of rural Africa that have been farmed sustainably since agriculture was created 10,000 years ago. The zone is currently home to four million people whose culture and ecology have remained intact in the face of both colonialism and globalization. However, as the short film A Thousand Suns (embedded below) illustrates, the worldview of the Gamo people that enabled this — and that could be fundamental in maintaining long-term sustainability, both in the region and beyond — is under unprecedented external threat. The Gamo region is basically devoid of roads, yet it is unique in its resistance to the food shortages and famines that have devastated much of the country. This is due to a unique traditional food system that interweaves a diverse number of tree, root, cereal, and vegetable crops with forestry and livestock production. Diversity in many ways defines the agro-ecosystem of the Gamo Highlands. It has a varied physical landscape, the communities are geographically isolated and the agricultural system incorporates an enormous genetic diversity of crop species. Due to the subsistence nature of farming and the availability of locally-adapted crops, individual farmers maintain an extremely high diversity of seeds and can name literally hundreds of crop varieties ranging from enset, barley and taro to yams, wheat and oromo potato. The Gamo is a unique system in which people and nature have co-existed sustainably for millennia. But in the last few years, the evangelical Protestant Church has made inroads into the most remote areas and is eroding the traditional animist social structures that have until now bound the people of the Gamo to each other and the environment. Members of these outside-funded parishes and schools have disdain for traditional values and have even begun to act in ways that run counter to Gamo culture, including cutting down sacred trees, disrupting community meetings, planting crops in pasture land, and denouncing indigenous leaders as backward or even evil. The results have been destructive, even to the point of causing violence between communities. Shot in Ethiopia, New York and Kenya, A Thousand Suns explores the modern world’s unjustifiable sense of separation from and superiority over nature, and how this is being imposed upon the people of Gamo. 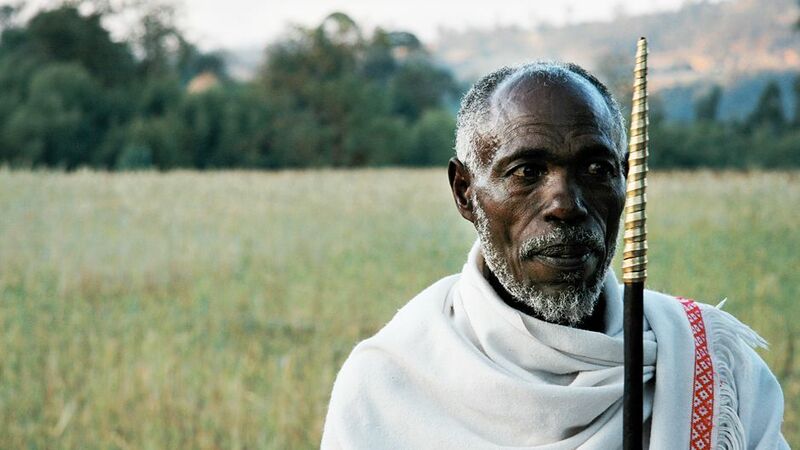 Six months after filming was completed, the Ethiopian government — at the behest of evangelical Protestant missionaries in the region — took away the organizational rights of 42 indigenous groups who focus on preserving the traditional cultures of the Gamo. There is another threat looming on the horizon for the people of the Gamo. In 2006, two of the United States’ biggest foundations, The Bill & Melinda Gates Foundation and the Rockefeller Foundation, joined forces to end hunger in Africa. Their Nairobi-based initiative is called the Alliance for a Green Revolution in Africa (AGRA) and its US $262 million budget aims to bring a ‘new’ Green Revolution to Africa. Through loans, farmers are encouraged by AGRA to use external inputs, such as expensive genetically modified seeds, chemical pesticides and fertilizers. As long as crops succeed then all is well, but when they fail the farmer is at risk of losing everything because they are now at the mercy of an external market system that dictates whether or not they receive an income. Many opponents of AGRA say that it is essentially a mechanism to generate profits for multi-national corporations. They point to the fact that the companies behind AGRA include Monsanto, Syngenta and Dupont — all of which are involved not only in the production of chemical inputs, but in the patenting of the genetically modified seeds that are being promoted by AGRA. These companies therefore stand to profit from the expansion of AGRA in Africa. While former UN Secretary-General Kofi Annan, as the Chair of AGRA, supports this model of development, a 2008 report from the United Nations Environment Programme (UNEP) — entitled Organic Agriculture and Food Security in Africa — argues that farming that does not use chemical pesticides and fertilizers is the best way to ensure food security in Africa. Globally, we continue to grapple with the question of how a growing human population can co-exist with the natural environment. The Gamo’s unique agricultural system and the worldview that sustains it provide valuable clues as to how this might be possible in the future. The people of the Gamo have developed the ability to conserve crop genetic resources while practising highly productive farming strategies. Globally, we are down to two or three viable strains of our most important food crops; whereas, in the Gamo, they have more than 65 varieties of barley, more than 12 varieties of wheat and more than 100 varieties of enset and dozens of varieties of cassava, taro and yam. The Gamo defies the common assumption that agricultural intensification decreases biodiversity. Furthermore, in UNEP’s analysis of 114 organic projects across 24 countries, researchers found that not only did financial stability and quality of life improve, but yields increased by up to 116%, out-performing conventional industrial agriculture. The Gamo people and culture are embedded in an ecosystem that is intensively managed and yet, unlike ours, includes an astounding amount of diversity, stability and resilience. Over thousands of years they have evolved a way of being in the world that has ensured their long-term survival. Their management of everything; from water tables, soil nutrient cycles to their social infrastructure stems from a view of the world as sacred, alive and entirely interconnected. A Thousand Suns: The View From Ethiopia’s Gamo Highlands by Emmanuel Vaughan-Lee and Alan Zulch is licensed under a Creative Commons Attribution-NonCommercial-ShareAlike 3.0 Unported License. Emmanuel Vaughan-Lee is an award-winning producer, director, musician and composer. Since founding the Global Oneness Project in 2005, Vaughan-Lee has directed and produced 27 short films distributed through the organization’s Webby-nominated web platform, and aired on PBS, Link TV, ABC Australia and Current TV, among others. He is currently an executive producer of Into Eden, a feature-length documentary sequel to the Warner Bros. film The 11th Hour. Prior to his work in media, Vaughan-Lee was a critically acclaimed jazz bassist, composer and recording artist, performing and recording with some of the biggest names in jazz. It is so true Africa does not need a NEW REligion. The Gamo have lived with nature for a long time and to change that will be a disator for the people of Gamo and for others in Ethiopia. I pray they will be able to overcome all these external threats. Organic farming will always be the best way for Africa and for all people.